Completely refurbished luxury apartment located in Cipreses del Mar, a complex with beautiful and well-kept gardens, security and concierge 24 hours a day plus surveillance system with cameras, with a nice communal pool located a few meters from the beach and the promenade. It has all the services and facilities one step away from restaurants and the well-known gym O2s Wellness centre right next door. It consists of living/dining room, master bedroom with bathroom en suite, 2 additional bedrooms, independent bathroom, fully equipped kitchen, spacious terrace facing south and a parking space in the underground garage of the complex. A house in one of the best residential areas of Marbella, both by location and quality. 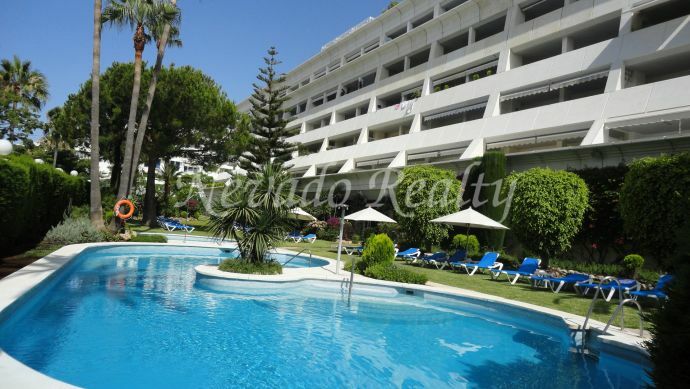 Please send me more information about ref 163-01471P, Apartment in Cipreses del Mar, Marbella Or similar properties.